Video: Patricia Ann McNair makes a painful "Return Trip"
And if you enjoyed that, please join us at 7:30 pm on Tuesday, March 5th, 2013, upstairs at Hopleaf, for an evening with Mairead Case, Lania Knight, Dana Norris, Zoe Zolbrod, and 2nd Story's CP Chang! 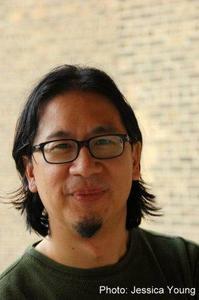 CP Chang, a company member of 2nd Story, is a writer and software consultant. He received his M.F.A. in fiction writing from Columbia College Chicago, and was formerly an Associate Producer for Elephant Rock Productions. He is blessed to be married to Jessica Young, a teacher, performer, and writer. CP will be reading as part of our mini-series featuring writers from the new 2nd Story anthology Briefly Knocked Unconscious by a Low-Flying Duck. Hear him and the rest of our outstanding readers on Tuesday, March 5, 7:30 pm, in the upstairs lounge at Hopleaf. Our March lineup at Tuesday Funk is fit to make every other reading series green with envy. The roster will feature Mairead Case, Lania Knight, and Dana Norris, not to mention The Beautiful Anthology's Zoe Zolbrod and 2nd Story's CP Chang. Throw in one of our patented Poems by Bill, not to mention your pick of cold beers from around the world, and you've got all the ingredients for a late-winter warm-up of epic proportions. We'll also be debuting our post-reading Q&A, which you won't want to miss! 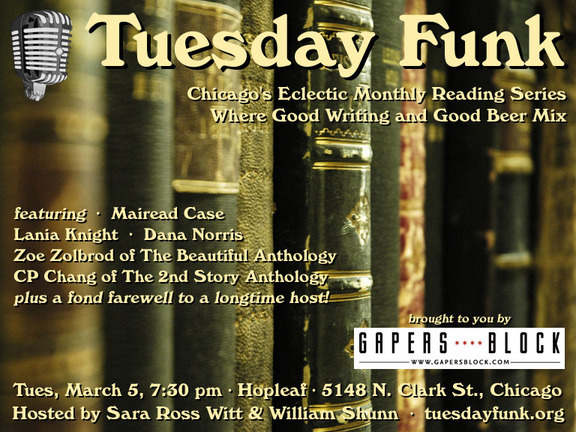 The evening gets underway with your co-hosts Sara Ross Witt and William Shunn on Tuesday, February 5th, 2012, 7:30 pm, in the upstairs lounge at Hopleaf, 5148 N. Clark St., Chicago. Arrive early for a table and grab a beer from Mark at the bar (where credit cards are now accepted!). 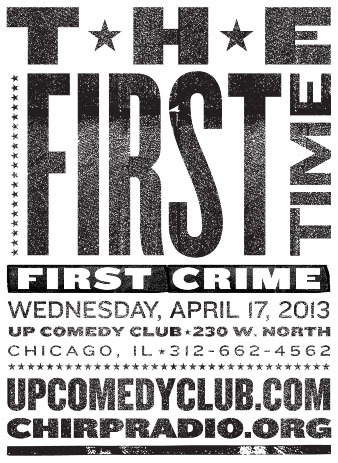 We start seating at 7:00 pm and no earlier. Admission is always free, but you must be 21 or older. And come early or stay late after for some great Belgian-style food downstairs. 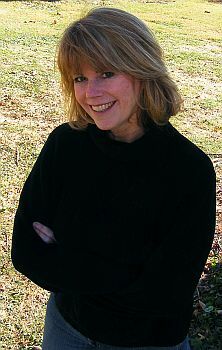 Patricia Ann McNair is the author of The Temple of Air, a finalist for the Society of Midland Authors Best Book Award and the Devil's Kitchen Reading Award. She's received four Illinois Arts Council Awards and was nominated for the Carnegie Foundation US Professor of the Year. McNair teaches in Columbia College Chicago's Fiction Writing Department. Patty will be reading as part of our mini-series featuring writers from the new 2nd Story anthology Briefly Knocked Unconscious by a Low-Flying Duck. 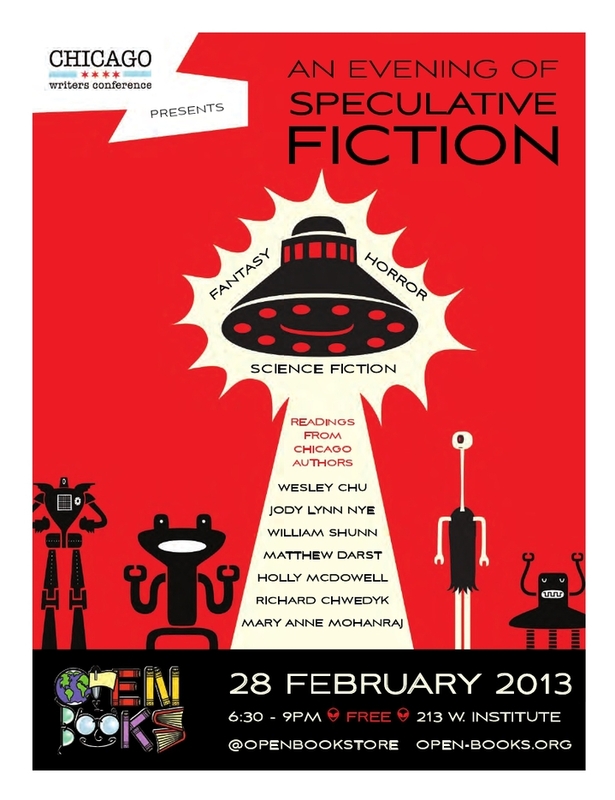 Hear her and the rest of our outstanding readers on Tuesday, February 5, 7:30 pm, in the upstairs lounge at Hopleaf. 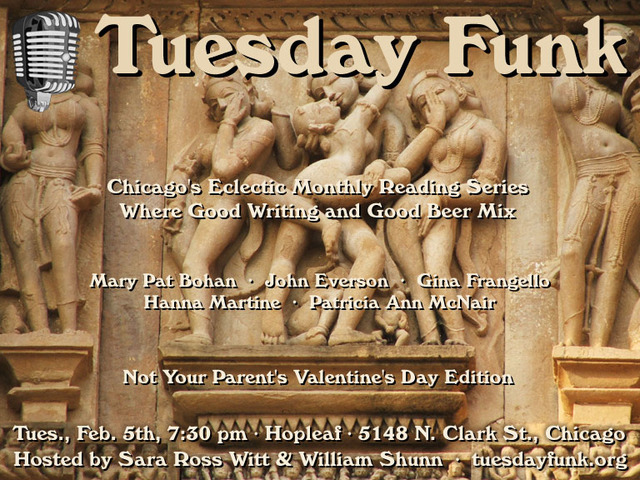 And if you enjoyed that, please join us at 7:30 pm on Tuesday, February 5th, 2013, upstairs at Hopleaf, for our Not Your Parents' Valentine's Day Edition with Mary Pat Bohan, John Everson, Gina Frangello, Hanna Martine, and 2nd Story's Patricia Ann McNair! Stand to attention, Funkers, because have we got a show for you! We're declaring February 5th to be Not Your Parents' Valentine's Day, and our subversive, saucy program that evening will feature Mary Pat Bohan, John Everson, Gina Frangello, Hanna Martine, and 2nd Story's Patricia Ann McNair. Throw in one of our patented Poems by Bill, not to mention your pick of cold beers from around the world, and you'll soon be begging us for more. This page is an archive of recent entries in the Other Series category. Open Books is the previous category. Participants is the next category.